This AidCamp was held in conjunction with our partner organisation Strategic Humanitarian Services (SHUMAS) in the rural village of Bamali in the Northwest province of Cameroon. 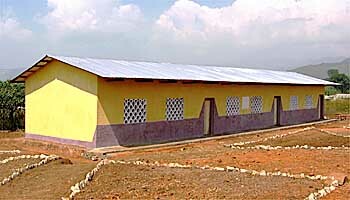 The AidCamp financed and built a proper primary school in the village, the previous school being a small dilapidated building that was unable to take all the primary school aged children of the village. The volunteers were also taken on visits to see SHUMAS's work in the area, as well as on several local and regional sightseeing trips to markets, the palaces of traditional chiefs, and to see local artisans at work. "I have just spent the last 3 weeks with a permanently fixed grin on my face. Some of my friends prior to departure would ask me quite seriously why I would classify a trip like this as a holiday? On the surface, I could understand their query. To them I was going away to do manual work, take part in the cooking and cleaning of the house which more than likely would have no water or electricity, and to socialise with 14 other people I had never met before. As I said, on the surface of it, you could understand their hesitation in wishing me a ‘good holiday’! The greeting we received upon arrival was exhilarating. A song filled precession led by dancing school children and women’s groups paraded us through the rest of the villagers who lined the route to our new home for the next 3 weeks - we couldn’t move for welcoming handshakes and smiles. I have a photo, taken in the darkness, in which all you can see is a sea of waving and smiling people. The welcoming song 'We are one, We are together, We are one' became a song that each and every one of us felt the power of by the end of the 3 weeks and could sing with just as much enthusiasm and feeling. I think I am going to find it very hard to explain absolutely everything that fixed that grin to my face. I remember sitting in the town bar one evening and having a wave of being overwhelmed (not the only time of the holiday) come over me and not be able to pin point one thing that had caused it. It was a day like most days on the project: 8-12 we worked on the site, that particular day we had completed the plastering of the inside of the toilet block (a proud moment), had gone back to the house for lunch (rice, yams, plantain, huckleberry and tomato sauce concoction) then spent the afternoon relaxing at the compound waiting for the midday heat to subside. At 4pm a small group of kids would grow at the end of our track looking for us to join them with the football. The excitement on their faces never waned for the whole time we were there. We’d walk up the track, kick the ball to the nearest kiddie, then from nowhere, loads of other smiling kiddies appeared trying to show off their football skills, and this was all before we even reached the pitch. Are you getting the picture? So, have you worked out why you should go on an AidCamp yet? 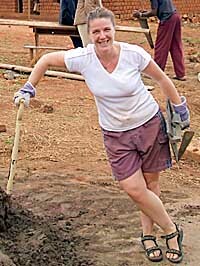 Everyone who goes finds their niche...there are plenty of tasks for all abilities ranging from super active – how about a few days of pick axing hard ground; to the not so super active – painting and gardening. My personal favourites were the messy jobs, plastering and plaster making...interspersed with 'tools down' moments while we gathered a crowd of children to take part in ‘Head Shoulders Knees and Toes’, ‘Hokey Cokey’ and any other guiding and childhood songs we could conjure up. I’m not too sure who was more entertained, them or us, but there were grins all round, which is the important point and I came away with a good few extra songs to add to my repertoire! It really was a truly humbling experience to be working every day with such enthusiastic and appreciative people. I really hope they realise just how much they have given to us during our stay. We may have built them a school with obvious material value, but through the welcome we received, the words of thanks, the invitations to their homes and the openness to share their lives, all of this was invaluable to us. "I thought I was here to help them to learn but my own learning curve was far greater. Humility, neighbourliness and much much more." "A wonderful 'gap 3 week'. A real way to get away from the stress of western life and learn about another culture." 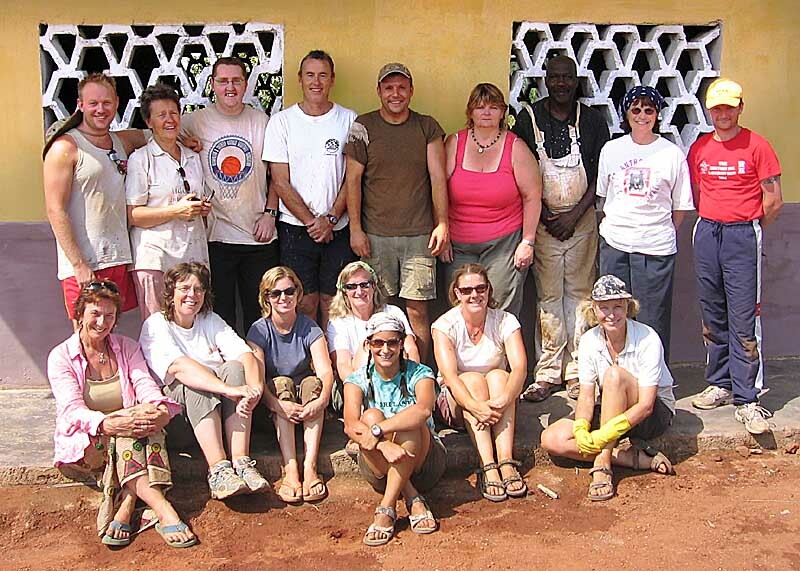 "I will never forget the wonderful welcome and the children's singing while we worked. Just a couple of highlights from many." "My second AidCamp in Cameroon, surpassed all expectations, wonderful people, the warmest of welcomes from SHUMAS and locals. I left my heart in Cameroon...AGAIN!" "Another great November in Cameroon, bring on 2007." "AidCamps was a wonderful life-changing experience." "Despite being an AidCamp veteran, I was completely blown away by this trip." "It has personally given me so much and I feel I have left many friends behind." "Thank you AidCamps for creating a brilliant way to make a difference." "You have to experience it to fully appreciate it, then you'll realise what you've been missing." "A smile on my face, a song from my voice, from beginning to end I had to shed a tear." "Great experience, one not to miss, very fulfilling." "Only go on an AidCamp if you want to have one of the most amazing cultural experiences of your life." "The ultimate in 'green' tourism. Leave behind a footprint of opportunity...Education. Expand your cultural understanding and be humbled." "It was a humbling and ultimately uplifting experience. I founds muscles (not to mention emotions) I didn't know I had. Words can't describe it -- you just have to experience it!" "I thought I was here to help them to learn but my own learning curve was far greater. Humility, neighbourliness and much much more." "A wonderful 'gap 3 week'. A real way to get away from the stress of western life and learn about another culture." 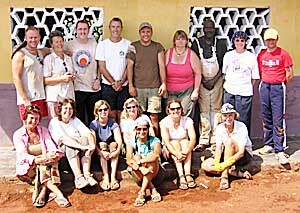 "I will never forget the wonderful welcome and the children's singing while we worked. Just a couple of highlights from many." "My second AidCamp in Cameroon, surpassed all expectations, wonderful people, the warmest of welcomes from SHUMAS and locals. I left my heart in Cameroon...AGAIN!" "Another great November in Cameroon, bring on 2007." "AidCamps was a wonderful life-changing experience." "Despite being an AidCamp veteran, I was completely blown away by this trip." "It has personally given me so much and I feel I have left many friends behind." "Thank you AidCamps for creating a brilliant way to make a difference." "You have to experience it to fully appreciate it, then you'll realise what you've been missing." "A smile on my face, a song from my voice, from beginning to end I had to shed a tear." "Great experience, one not to miss, very fulfilling." "Only go on an AidCamp if you want to have one of the most amazing cultural experiences of your life." "The ultimate in 'green' tourism. Leave behind a footprint of opportunity...Education. Expand your cultural understanding and be humbled." "It was a humbling and ultimately uplifting experience. I founds muscles (not to mention emotions) I didn't know I had. Words can't describe it -- you just have to experience it!"